Whirling overhead at all times are stars, planets – whole galaxies. Humans have always wondered at them and about them. Blindness is no impediment to curiosity, including in the area of astronomy, nor is their any reason blind people can’t learn much in this field, often thought to be too visual. Some have even become astronomers themselves. So, with the help of Arapahoe Community College Astronomy Coordinator and Instructor Jennifer Jones this month’s FAST (Fun Activities and Skills Training) Friday program for blind youth will teach about the stars with tactile graphics of constellations, 3D printings of telescopes and, finally, a trip outside to see what is in Friday night’s sky. Members of ACC’s Astronomy Club will be helping out too. We’ll also learn a little about the science of sonification as it applies to studying various astronomical phenomena. With luck, we can inspire anew generation of blind astronomers! Oh, and we’ll bring snacks. That’s inspiring … right? 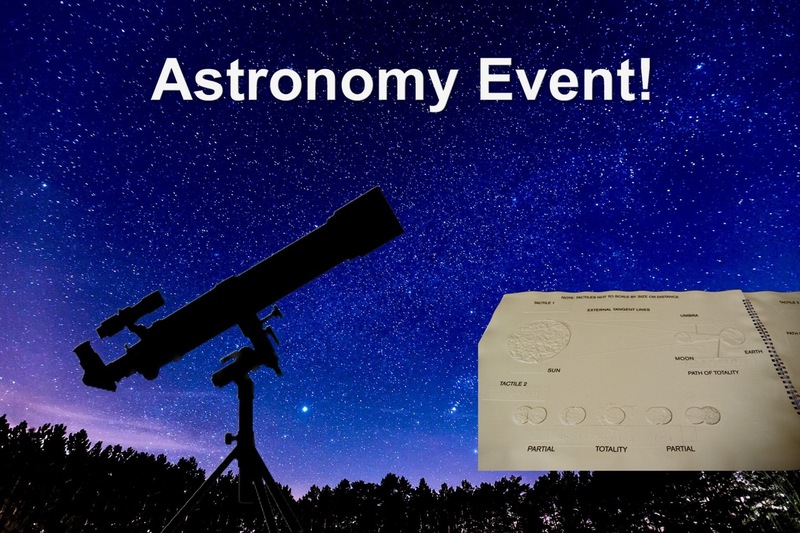 There’s a change of time (later so as to use the telescope after dark), and change of venue for our April FAST Friday. It’s best to enter the Main Building from the north side. The entrance is on College avenue right at the pedestrian crosswalk. Parking is across the street. For bus riders, this is the western end point of Route 66. Doing a Google search for blind astronomers will turn up some interesting results, though a couple of the links below were already known to this blogger. When you learn just a little about how these blind astronomers do their research, it quickly becomes apparent that astronomy isn’t limited to the visual, but rather that it’s been taught that way, often exclusively that way. Until recently that is. My Google results showed that not all curious blind would-be scientists felt constrained by those teaching limitations. The 1997 sci-fi movie, Contact featured a blind astronomer, Kent Clark, who was based on the true-life blind astronomer, Kent Cullers, who worked for NASA’s Search for Extraterrestrial Intelligence (SETI). One of SETI’s projects was to process radio signals from space using the computing power of PCs around the world. if you wanted to help, you invited SETI to use your PC while you weren’t, and early application of crowd-sourcing. Cullers was blind from birth and is now retired. Wanda Diaz Merced was already an astronomer when she became blind, and her TED Talk, How a Blind Astronomer Found a Way to Hear the Stars won’t be a wasted 11 minutes and 16 seconds out of your life. There is in fact a Blind Astronomy Guild, with members across this tiny, spinning globe. Just what is a “mock interview?